← Help Us Celebrate 50 years on August 7! NEWPORT, Ore. – Fifty years ago this summer, Oregon State University’s Hatfield Marine Science Center opened its doors as a fledgling research and education facility envisioned to help the depressed central Oregon coast economy revive. Today it stands as one of the most important and unique marine science facilities in the country, bringing together a plethora of scientists from different agencies to tackle some of the most pressing issues facing the world’s oceans, educating a new generation of students about these issues, and reaching out to inform the public about their impacts. This month, OSU and the Hatfield Marine Science Center will commemorate their half century of success with a celebration and reception on Friday, Aug. 7, at the center. The public is invited. The 50th anniversary celebration will begin at 4:30 p.m. just outside the Hatfield Marine Science Center, located south of the Yaquina Bay Bridge in Newport. The celebration will feature speakers, displays, a historical slide show, and a video featuring faculty, student and community perspectives on the center’s future plans. A reception will follow from 5:30 to 7 p.m.; the events are free and open to the public. Earlier in the day, a special presentation by Rick Spinrad, chief scientist for the National Oceanic and Atmospheric Administration, will be held in the Visitor Center Auditorium. His talk, “How Oceanography Saved the World,” which begins at 3 p.m., is part of the 50th Anniversary Alumni Speaker Series. He is former vice president for research at OSU – and a former graduate student at the center. Other speakers include former Oregon State President John Byrne, a former NOAA administrator. 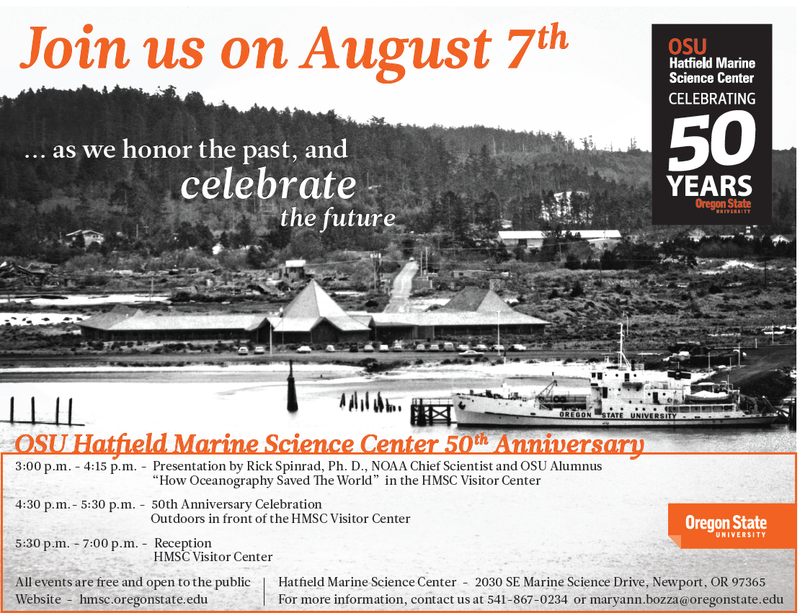 Event information and links to HMSC archives, historic photos, video and a timeline of landmarks for the Hatfield Marine Science Center can be found at: http://hmsc.oregonstate.edu/50th. Photo of the Week – Happy Halloween!